While the Fed’s taper talk has been tapered and then un-tapered, the market may now be tapering the Fed rather than vice versa. Let’s assess Act 2 of the taper talk and the implications for the markets, including the dollar and gold. •	Introducing an employment target, signaling rates may stay low even as economic growth picks up. •	Housing. Bernanke strongly believes higher home prices are important as it reduces the number of homeowners “under water” on their mortgages. Under water homeowners may not be good consumers. Bernanke suggests tapering may proceed if the housing market can stomach higher rates. Our view is this recovery particularly sensitive to swings in mortgage rates. •	Unemployment rate. A lot of jobs being created are part-time rather than full-time jobs. This may have to do more with Obamacare than anything else, as employers will be exempt from offering health insurance to part-time employees. •	Labor participation rate. It’s no news that the labor participation rate has been declining. In the past, however, Bernanke had brushed this off as a sign of an aging population. But someone must have shown him the more detailed analysis, suggesting that the elderly are actually working more, and those under 55 years old are having trouble finding jobs. The reason we focus so much on the Fed is because they control the printing press. Ultimately, however, the Fed is merely a market participant akin to someone sipping with a straw from the ocean. 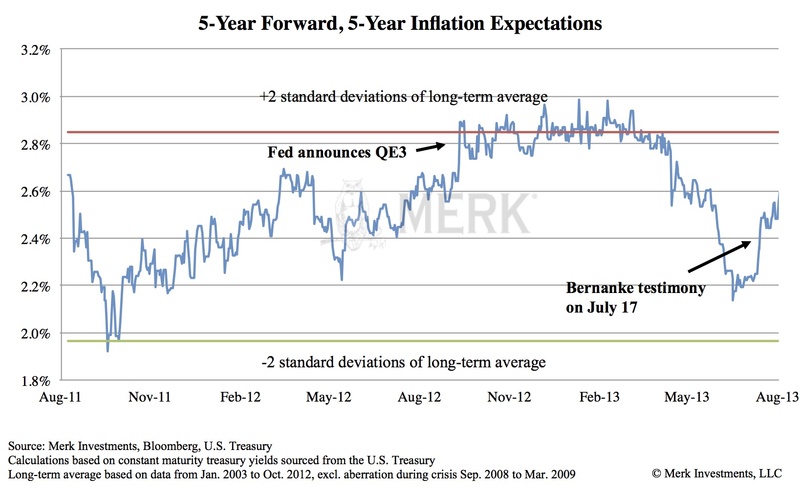 Fed talk works as long as there is confidence in the policy being pursued; and, by the way, talk is cheaper than action. But when the markets start to question the Fed, implementing policy can become very expensive. Traders want to hear little about headache inducing taper talk; all they see is that they may have to sell to themselves rather than to the Fed, as a prominent bond investor recently tweeted. And while pundits tell us that this economy has recovered from the financial crisis, we believe much of the world is addicted to cheap money and remains vulnerable. But how do you wean someone off an addiction? As the Fed is learning, it’s not easy. Most notably, “fine tuning” the process may be all but impossible. In the meantime, as the market is at risk of tantrums, the Fed is focused on its dual mandate to foster price stability and maximum sustainable employment. As market volatility itself is a headwind to economic growth, it’s another indication that the Fed may need to err on the side of easy money. In the meantime, the U.S. Treasury is expected to (on net) issue less debt in the coming months as tax revenue has been higher than expected; separately, fewer mortgage-backed securities (MBS) are being issued as the havoc in the bond market has thrown a monkey wrench into the mortgage origination market. Taken together, the Fed pretty much has to reduce its purchases, not to “taper”, but in order to avoid buying an increasing portion of debt issued by the government. •	Volatility is to remain high. The most obvious losers are emerging market debt markets. Those markets had seen major inflows while interest rate risk was masked by what we deem to be abnormally low bond market volatility. Now that volatility has spiked, investors appear to be heading for the exit, causing double the pain in these not so liquid markets. •	Stock markets at risk. U.S. equity markets have been shrugging off higher yields. Investors have been conditioned to buy the dips. As in previous market corrections, it’s less hazardous to one’s health to take profits before a correction – as long as there are still profits to be taken. This may be a good time to rebalance a portfolio. •	The dollar has not benefited from recent dips in the markets. Indeed, the euro outperformed the dollar last year; this year, so far, the euro is the best performing major currency. Beware when there’s too much talk about clean shirts. Sometimes there’s value where the shirts look dirtier. •	Just as the dollar may have peaked, those shorting gold have now learned that there is risk in betting against the shiny metal. While most of our heads are spinning with all the taper talk, those buying gold are looking beyond the noise and see that governments in the U.S., Japan, UK and Eurozone may not be able to afford much higher rates. Economic growth is not the enemy of gold as pundits make us believe; instead, economic growth may unmask that central banks cannot tolerate higher rates. We will expand on this discussion in a special webinar on gold this Thursday entitled. Please register to participate in this exclusive webinar entitled “Why I own gold.” Also make sure you subscribe to our newsletter so you know when the next Merk Insight becomes available.